Not being a lovely lady in a state of semi-undress, I did not expect to ever make an appearance in FHM. 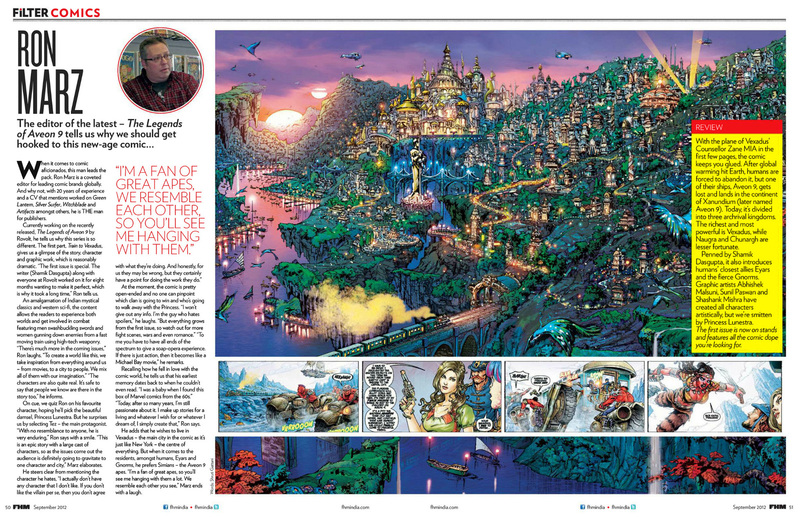 And yet, there I am, in FHM India, interviewed about my editing duties for Rovolt Entertainment’s Legends of Aveon 9 title. Click on the pieces for a “larger, more readable version. 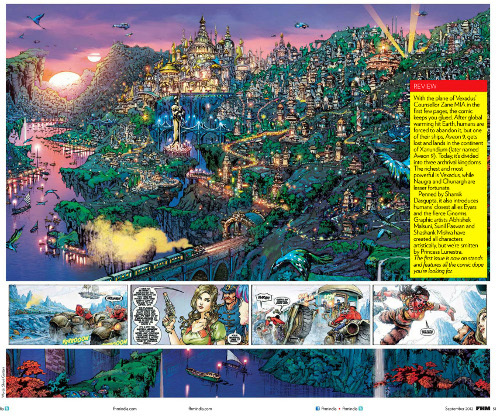 I’ve also written a travel story for Air India magazine, illustrated by the supremely talented Abhishek Malsuni, artist of Aveon 9. I’ll try to post a link for that when it’s available. Unfortunately, I have to announce that I am no longer involved in The Historians project that was unveiled at the Baltimore Comic Con. This was not my choice, nor the choice of artist Jamal Igle, or publisher IDW. I’m disappointed the project did not work out as planned. To my knowledge, Jamal has left the project as well. It’s best to describe the situation as one of creative differences, and leave it at that. I hope to work with both Jamal and IDW at some point in the future. I wish the best of luck to The Historians moving forward. I’ll be appearing at this weekend’s Baltimore Comic Con, held this Saturday and Sunday at the Baltimore Convention Center in the inner harbor. Show hours are 10 a.m.-7 p.m. Saturday, and 10 a.m.-5 p.m. Sunday. The Baltimore show is among my favorite cons, thanks in no small part to the great work by promoter Marc Nathan and his right-hand man Brad Tree. I look forward to it every year, though this year in particular brings some new wrinkles. I’ll be set up at booth #2307, along with my buddies Lee Moder and Matthew Dow Smith, both of whom will be taking commissions and selling original pages. There might even be a surprise appearance by Nelson Blake 2nd. Lee and I will have copies of Shinku on hand for your purchasing pleasure, with a few other assorted items. 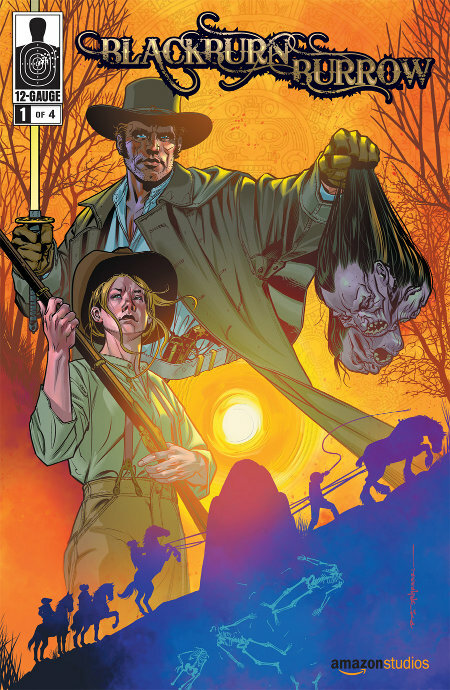 I’ll also be appearing both days at the Amazon Studios booth, #1602, with a sneak peek of Blackburn Burrow #1, by me and Matthew Dow Smith, with color by Jordie Bellaire and a cover by Brian Stelfreeze. 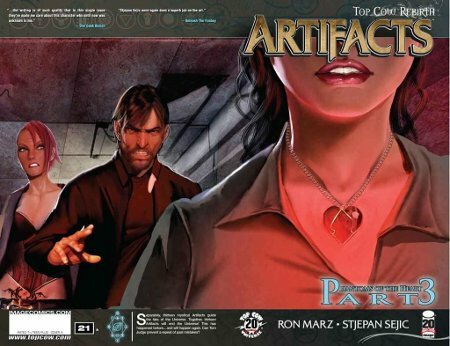 The issue is part one of a four-issue adaptation of an Amazon Studios screenplay by Jay Levy, and Amazon will be giving away the Baltimore Comic Con exclusive edition all weekend. So … free comic! Pretty awesome, huh? If you can’t be in Baltimore, don’t worry, issue #1 soon will be offered online for free. I’ll be signing at the Amazon Studios booth, 11:30 a.m.-12:30 p.m. and 3-4 p.m. Saturday; and 1:30-3 p.m. on Sunday. Blackburn Burrow is supernatural historical adventure, set in 1864, as the Civil War rages on. It’s about secrets buried deep in a Georgia mountain, and secrets buried deep in the heart of its ghost-hunting protagonist, known only as Mister. Last and certainly not least, I’ll be announcing a new project on Sunday at the show, during a spotlight panel with me and artist Jamal Igle. The panel will take place from noon-1 p.m. Sunday in Room 301. Jamal and I will talk about our respective careers, and then discuss our new project (though you might well get a sneak peek of the project at CBR this week). New York Comic Con on Oct. 11-14. Fest Comix in Sao Paulo, Brazil on Oct. 20-21. HeroBotCon in Elmira, NY on Oct. 27. Albany Comic Con on Nov. 11. 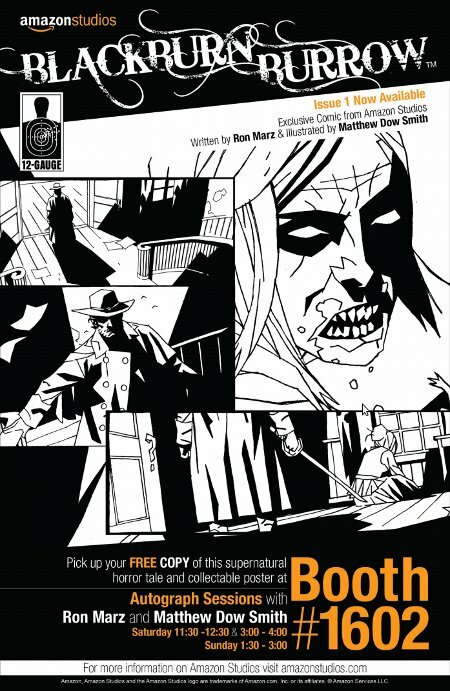 Arriving in stores this week is The Ride: Southern Gothic #1 from 12 Gauge Comics, containing a crime story by me, Rick Leonardi and Dexter Vines, presented in glorious black and white. It’s actually the first half of a story involving meth runners, the Dixie Mafia and the familiar car of the title. Part two of the story, drawn by Tom Raney, will appear in the concluding issue #2. Other creators in issue #1 include Nathan Edmondson, Jody LeHeup, Paul Azaceta and David Lapham, with a cover by Andrew Robinson. I like crime stories, I like writing short stories, I like black and white, and I love working with Rick Leonardi, whom I consider one of the best storytellers in comics. My previous story for The Ride appeared in the Foreign Parts one-shot, with phenomenal art by Chris Brunner and Rico Renzi. It’s one of my favorite stories, and got a nice notice in Entertainment Weekly back when the print version actually paid some attention to comics. 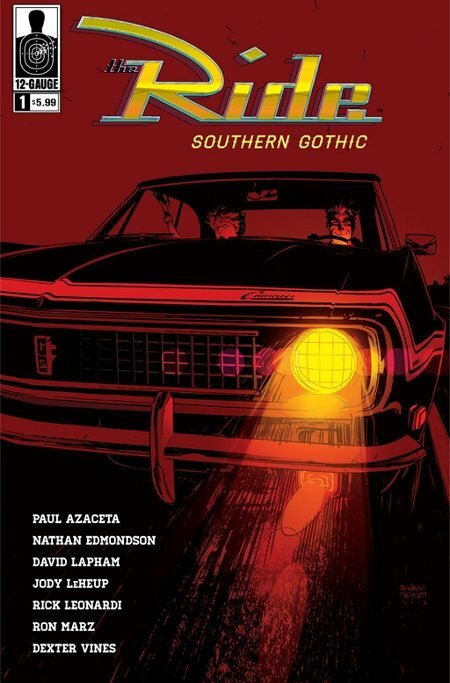 Hope you seek out The Ride: Southern Gothic #1 this week. Independent books like this need your support. Also, last week slipped by without a mention of Prophecy #3, which arrived in stores Aug. 29, continuing the Dynamite Comics crossover. The story brings together disparate characters including Red Sonja, Vampirella, Dracula, Herbert West, Pantha and Athena, among others, gathered to oppose the sorcerer Kulan Gath’s attempt to end the world. Issue #3 includes a return appearance by Sherlock Holmes and Dr. Watson, who opened the series.